The fox has many tricks, and the hedgehog only one, but that is the best of all. On a sunny afternoon, I suggested to one of my colleagues that we should head to one of the most idyllic districts in Helsinki for lunch. This district of about 8 000 inhabitants, located about five kilometers from the city center, is called Käpylä. It's most known for its wooden area that is a combination of English-type garden cities and a small-town Finnish milieu. Most of the houses in this wooden area were built in timber in 1920-25 and designed in the so-called Nordic Classicism style prevalent throughout the Nordic countries at the time. Nowadays, these wooden houses are very popular – some apartments still have the original wood-burning stoves and fireplaces. And the tenants still enjoy their green and peaceful environment. Aurinkoisena iltapäivänä ehdotin yhdelle kollegalleni, että lähdetään lounaalle idylliseen puu-Käpylään. 8 000 asukkaan Käpylä sijaitsee vain viiden kilometrin päässä Helsingin keskustasta ja varsinkin alueen puualue on todella kaunis! Suurin osa sen suosituista puutaloista ovat rakennettu 20-25-luvuilla ja edustavat pohjoismaalaista klassismia. In this district, there's been a pleasant surprise this summer - café Siili (directly translated: hedgehog, named after the hedgehog that lives in the area). As I haven't grown up in a district like this, I've always been fascinated by these houses. Cute as candy, if you ask me. I was, however, born in a wooden building similar to these in Helsinki's district of Kumpula, but we moved away when I was at the age of two. Café Siili is located in the stone foundation of one of these buildings. 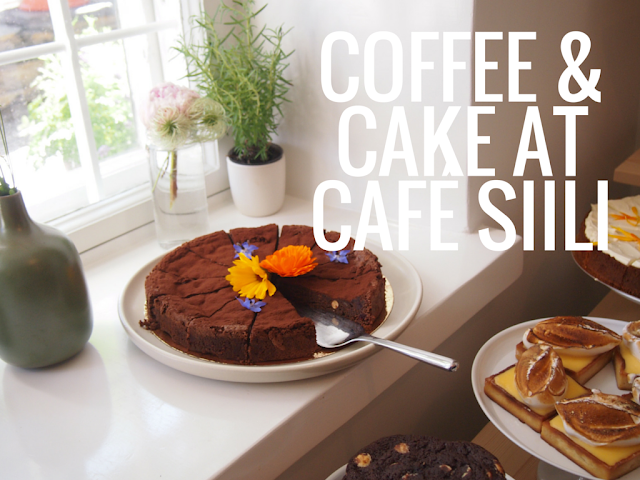 We enjoyed excellent coffee, carrot & chocolate cake and sandwiches at this lovely café. When we headed back to the office, it felt like we had been to another reality - that is how tranquil and dreamy this district is! Tämän kesän uutukainen on ollut kahvila Siili, joka on nimetty alueella asuvan siilin mukaan. Vaikka itse synnyin Kumpulan puualueella, en muista siitä paljonkaan koska muutettiin alueelta pois kun olin 2-vuotias. Karkinväriset puutalot ovat kuitenkin lähellä sydäntäni, ja mielestäni kuin suoraan satukirjasta. Kahvila Siili sijaitsee puutalon kivijalassa, ja sieltä saa ihanaa kahvila, herkullisia kakkuja ja voileipiä. Kun lounaan jälkeen palasimme toimistolle, tuntui kun olisimme käyneet eri todellisuudessa - niin rauhallinen ja unenomainen Käpylä on! What is your favorite café? Do you have a wooden district in your city / hometown? Mikä on sinun suosikkikahvilasi? Pidätkö itse puutaloalueista? The house is amazing, what for a great idea to go to that district! I loved that style and it all looks so peaceful around! I also loved the cookies! Your hat looks great and you look like really emjoying, beautiful! I would love to know this cafe, it looks amazing! Right? :) Thanks for your kind words Denise. I don't have a favourite cafe right now because I think we only have one real cafe in my hometown and I haven't even visited it yet. I should one day! but the one you guys visited looks lovely and I would totally try their baked goods! everything looks delicious! Really? You have to, I want to know if it's as good as the cafés in Pärnu!